The Creators Project is a global network dedicated to the celebration of creativity, culture and technology. Founded by a revolutionary partnership between Intel and VICE, The Creators Project celebrates visionary artists across multiple disciplines who are using technology in innovative ways to push the boundaries of creative expression. I tried to make a non-spoiler report of the event. It worked quite well, so don´t be afraid, I have not added detailed scene descriptions. This will be a review by a fan. There are lots of recollections written by the press, but I was keen on writing an individual one for Fixes instead of collecting snippets written by professionals because I think its a different angle seeing it when you are living with that tiny Nick Cave goblin in your brain day by day since years plus: I had control over the spoilers. There we are in front of the International cinema at Karl-Marx-Allee in Berlin waiting to see what a documentary about one fictionalized day in the life of our favourite artist will look like. Its a large cinema and therefore also those of us who were not sure if its a good idea to sit in the front row decide that it is. So there was nothing between us and the huge screen that would contain a lot of Nick Cave within the next hours and though my neck might disagree – that decision was a good one because it was like being swamped by a huge version of him and I could not wipe a delirious smile off my face for most of the time. I can only speak for myself, but the beginning of the movie was quite hard to watch. I heard other voices that said it is very nice, but for me it was a shocker. The good news: After having seen the full movie I thought the start was especially brilliant. Iain and Jane said in an interview that they were not interested in taking off the mask and that they want to keep a certain myth about the artist. Those first few moments of the film make you worry for a short while they were serious about it. To me it was a well-done demonstration of the fact that Jane Pollard is right. I want that a project that involves parts of Nicks personal life does not make him look too normal and ordinary. Though I am fine with the fact that he has this side and have seen glimpses of it that were very charming, I can´t think of a good reason why pieces of art that involve him should show too much of it. So I am very happy about the way they realized that in the movie. In the complete film there is not one single moment when I had to doubt if I want to see that. It was a perfect mix of fiction and reality. I have never seen anything like that and it completely overwhelmed me to see so much of this man I admire without something destroying what he is for me. It was more like being close to him during shows when you let him drew you into his own world than anything that reminds you of “reality TV”. There are certain passages in it that the ones who read most articles that come out will remember because he repeated them in interviews during 2013. I made up my mind about this topic more than once and think that Nick himself is also working actively on the myth. He said in different contexts that he has the feeling he becomes the thing that he creates. The movie is fuel for that flame and I am sure opinions will be different on that, but the transformation Nick likes to mention is something he seems to go through not only on stage. His whole persona changes. The character we as followers see at least. When I thought about that I remembered an interview with Mick Harvey I read. Mick said something similiar like he won´t say how many different Nick Caves he got to see during the years cause he does not want Nick to send him his lawyers. The movie makes you think a lot. I would be curious what people who just watched it as a rock documentary think about it, people who are not that much into Nick, just to compare both strings of thought to each other because I imagine they can be quite different. Apart from all the glory of diving into what is presented as the content of Nick Caves head in that movie it also makes you think further about what reality is and what the whole rockstar/cult figure hype is build upon and if its a good thing or a bad thing. You also question yourself because you see this sharp line even better in that movie. Between a “normal” creative person and the superhuman you tend to make out of him. While sitting in front of Nick, now finally regretting your decision to go for the front row because you needed a break after the movie before you were hit by his physical presence, you ask yourself why your heart is beating so fast and why you act like a nervous child. Then Jane Pollard says that even people who know Nick tend to be different when they are around him and you think “Ok then” and smile yourself randomly through what seems to be an eternity. The man himself seems to be a) tired of talking b) not comfortable with the whole situation c) would prefer to go out smoking than sitting down and answer questions. He randomly searches something in his pockets he does not seem to find and he switches between being very charming and very arrogant and I don´t want to use the word arrogant in such a negative way here. It just means that a person is trying to hide/protect behind a certain attitude and that was fitting the whole topic of the evening very well. Nevertheless he says quite a lot in the end. I especially remember him saying that he is fine with whatever mental disorders he has because they work good for him after being asked if he wants to do a real psychotherapy after he talked to the psychoanalyst for the movie. That was interesting for me because it was what I always thought would be Nicks attitude towards it. Iain and Janes answers make the fact that they created a beautiful beast with this film seem so effortless, like their instinct just tells them the right things. I am sure it is not that easy, but they make it sound like a kind of natural process from their perspective. I finish with what stood out for me the most in the movie and is my personal conclusion: I want Iain and Jane to make all concert videos. I know they have better things to do as the film proves they are very talented and have an outstanding sense for the visual presentation of things, but the material is breathtaking. It left me, and not only me, speechless and very emotional. I have no idea how they did it, but they captured the massive energy of a Bad Seeds concert in a way I have rarely seen before. After whatever I think about how I glorify Nick Cave: This is the very essence of why I ended up in this kind of “cult”. Seeing those concert snippets on such a large screen, reminding the hours you´ve spend in front of that stage yourself. Being sucked in and spit out by that machine. Having been mesmerized by this amazing band and Nick Cave in his purest state, as the outstanding performer he is…it stops you question anything. Its all perfect like it is. Iain Forsyth and Jane Pollard. Humble as hell and really gifted. I have expected it to be good, but it blew me away. This is very exciting, the first official clip from 20,000 Days on Earth has been released! The film will screen this week-end at the Berlinale Film Festival and on Monday will be followed by a Q&A with Ian, Jane and Nick. For our American fans, the movie will be part of True/False Film Fest in Missouri. More info here. Jane and Ian will be there as well. Highlights from the press conference. Full press conference is here. “20,000 Days on Earth” has won the Editing Award as well as the Directing Award in World Cinema Documentary at Sundance. Congratulations to Editor Jonathan Amos as well as Directors Iain Forsyth and Jane Pollard (pictured here below with Nick), and everybody who has worked on the film of course! On Monday January 20th, the much anticipated documentary 20,000 Days on Earth, will receive its world premiere at the Sundance Festival in Utah – USA. 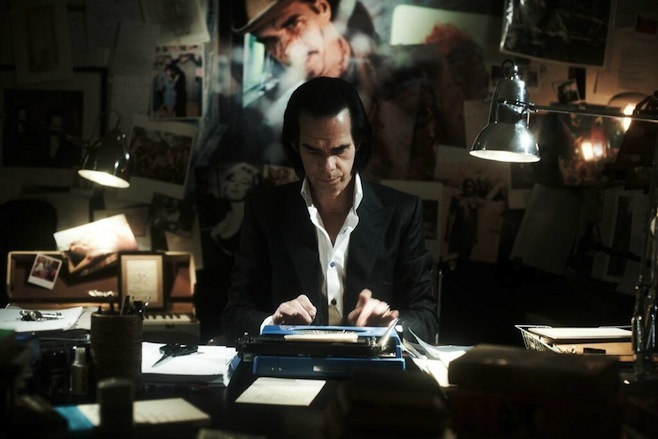 It has been confirmed that Nick Cave will be there for the Q&A with directors Iain Forsyth and Jane Pollard. I am sure many articles and interviews will follow so here is the master post where I will post what I find. Don’t hesitate to contribute in the comment section. If you are lucky to be at Sundance and want to write a review, feel free to do so as well! In the meantime, it’s been announced that the documentary will show at the International Film Festival in Berlin (Feb. 6th – 16th). More info here. The official website has been updated.